Princeton's graduate programs share a number of distinctive and desirable features: a high level of engagement between distinguished faculty and outstanding students, a residential campus environment that fosters a community of scholars, and a depth of financial support that allows concentration on academics. Degree programs are structured in a manner that provides students with excellent training while maintaining a relatively short time to degree. Academic Affairs at the Graduate School is charged with the administrative oversight of all graduate programs and the academic standing of all graduate students. Fields of Study - Advanced degrees are offered through 42 academic departments and programs that directly admit students, as well as a number of interdepartmental and joint degree programs that students may pursue once enrolled. Certificate programs are also available to admitted degree-seeking students in certain fields. Degree programs are housed within four divisions – Humanities, Natural Sciences, Social Sciences and Engineering. Doctoral education, available in all divisions, emphasizes original and independent scholarship, while master's degree programs in architecture, engineering, finance, public affairs, and public policy prepare candidates for careers in public life and professional practice. The wide range of interdisciplinary areas complements and enriches the degree-granting programs, which promote intellectual activities and research across departmental and divisional boundaries. Degree Requirements - The Graduate School tracks standard degree requirements that all students must meet to continue their work in good academic standing with the University. Requirements set by the Graduate School include major milestones that all Ph.D. students must meet in order to successfully obtain their degrees. Course Information - While the Graduate School has no centralized course requirements, the Academic Affairs unit oversees grading policies, course enrollment procedures, and grade change requests. Student Enrollment Statuses - All degree-seeking and former students may hold various statuses throughout and after their time at the University that reflect their current standing with the Graduate School and the associated benefits. 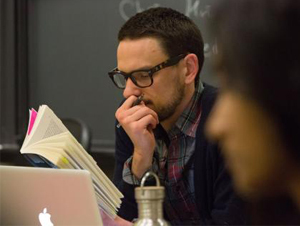 Categories of Nondegree Students - The Graduate School hosts a variety of nondegree students from other institutions who come to Princeton to take courses, collaborate with members of the Princeton faculty, and conduct advanced research using Princeton's libraries and research laboratories. Nondegree statuses provide visiting students access to many of the same benefits as our degree-seeking students while they work at Princeton. Opportunities and Resources - The Graduate School and many of our campus partners provide students with various support programs to help them during their graduate careers. Students are encouraged to utilize these services during their tenure to improve and diversify their skills, to discover new interests and passions, and to stay on track to obtain their degrees in a timely fashion. Partnerships, Exchanges, and Cross-Registration - The Graduate School participates in many international and domestic partnerships, exchanges, and cross-registration agreements. These programs provide graduate students with an opportunity to engage in academic work at another academic institution during the course of their graduate work.